Bobcat Goldthwait is showing WILLOW CREEK at the Syracuse Film Festival. The film stars Alexie as part of a couple who go into the infamous woods to try to find proof of the bipedal creature. The article to fallow. Writer-director Bobcat Goldthwait’s movie “Willow Creek” is screened during the Syracuse International Film Festival on Saturday, October 5, 2013, at the Palace Theater. Appearing on screen are actors Alexie Gilmore and Bryce Johnson. A really good and positive review of Alexie’s film WILLOW CREEK. I like those. Enjoy. After films like Shakes the Clown (1991), Sleeping Dogs Lie (2006), World’s Greatest Dad (2009), and God Bless America (2011), you surely know what to expect from writer/director Bobcat Goldthwait by now, right? Loud, colorful, perhaps even garish social commentary and raunchy farce from a stand-up comic turned actor turned surprisingly good filmmaker. Wrong! 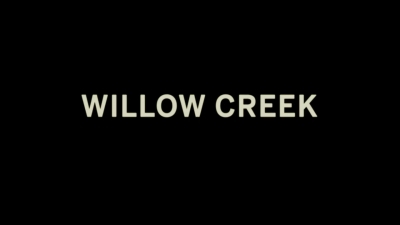 The man’s latest film is a refreshingly matter-of-fact horror/thriller called Willow Creek, and to my eyes, it’s the best sort of “homage” you can do. Based solely on Willow Creek it seems plainly evident that Goldthwait is a fan of A) “found footage” horror films in general, and B) The Blair Witch Project in particular, and so he packed up a few (very good) actors, a handful of cameras, and hit the road to make a low-key scary movie that works for all the reasons I just mentioned. Right off the bat I’ll “warn” you that the 78-minute Willow Creek is what’s widely referred to as a slow burn. As in, the first two-thirds of the movie are spent setting up the (simple) plot, the (cool) setting, and the (refreshingly cool) lead characters. Jim (Bryce Johnson) is an amateur filmmaker who wants nothing more than to document a trip deep into “Bigfoot” territory, and Kelly (Alexie Gilmore) is his sweet, smart girlfriend who comes along to help out. That’s it. Two people, one camera, one goal: dig up some dirt on Bigfoot! At its best moments, Willow Creek feels like someone (probably Goldthwait) was watching Blair Witch and thought, “Hey, that’s cool, but what if we tried a new angle, or went in a different direction, or what if we (I dunno) made the characters likable?” (I’m just kidding around. I love The Blair Witch Project, and the fact that it still inspires good filmmakers is a testament to its overt coolness.) Johnson and Gilmore bring an effortless chemistry to the film, which (it must be said) elevates Willow Creek beyond so many of its “found footage” ilk. For a horror flick in which, frankly, not a whole lot happens for 45 minutes, the actors do make it interesting enough. The patient horror fans will certainly enjoy what the third act of Willow Creek has to offer, and soon there will be a lot of geeky discussions over the film’s one “super-long” (almost 20 minute!) take, but speaking as a guy who sees a lot of movies in which two people point a camera at dark shadows, I say Willow Creek is a calm, cool. creepy little winner. It coasts on the skills of the lead actors, and then it transforms into a powerful cauldron of legitimate suspense. Lots of indie horror flicks can steal a scare or shock you with some gore, but Willow Creek sustains actual suspense for an admirable amount of time. Straightforward, simple, scary. I like it.